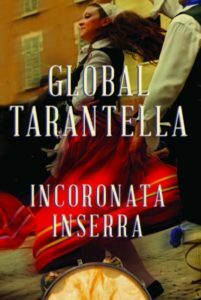 In Global Tarantella (University of Illinois Press, 2017) Incoronata Inserra ventures into the history, global circulation, and recontextualization of tarantella, a genre of Southern Italian folk music and dance. Examining tarantella’s changing image and role among Italians and Italian Americans, Inserra illuminates how factors like tourism, translation, and world music venues have shifted the ethics of place embedded in the tarantella cultural tradition. Once rooted in a world of rural Catholicism, tarantella now thrives in urban, secular, migrant, and ethnic settings. Inserra reveals how the genre’s changing dynamics contribute to reimagining Southern Italian identity and shows how its global growth promotes a reassessment of gender relations in the Italian South, helping create space for Italian and Italian American women to reclaim gendered aspects of the genre. Performed in many countries, mazurkas are usually flirtatious couple dances. In Italy, La Mazurca is danced primarily throughout the northern part of the country, although Sicilian versions do exist. This is a courtship dance which shows its character in a series of mimed teasing and coaxing, with first the women, then the men, promenading before one another to give each other the once-over. This mazurca is danced to “Oi Bela Vorejsse V’ni,” a traditional song of Piemonte in Piemontese dialect. In the teasing lyrics, the man tries to entice the woman to go away with him. She replies that, if he wants to marry her, she’ll gladly join him; otherwise, she’ll just wait where she is. This dance is done with no less than three couples, and it looks nice with five to six couples. If you want more couples to participate, a second circle could be set up if the dance area is large enough. BEGINNING POSITION: Double circle, partners facing each other, men with backs to center of circle. Man and woman hold multi-colored ribbons between them (1 yard lengths in several festive colors, knotted or sewn together about 6” from either end) both in right hands at approximately shoulder level. Man’s free hand on hip, woman’s free hand holding skirt. Circle moves counter-clockwise (CCW). Beginning formation: Couples in a circle facing LOD. Partners stand side-by-side with woman on man’s right. Arms are crossed in front, right arm above (skater’s position) with hands held at chest height. This choreography was created for BALLIAMO! of Sacramento, California, based on material presented at the 1994 Mendocino Folklore Camp by Celest DiPietropaolo and Marie DiCocco. 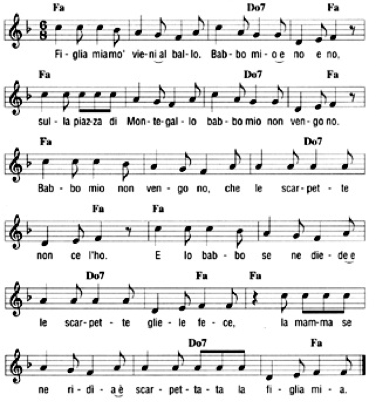 It was taught at the 2002 IFAFA Conference in San Francisco by Drew Herzig, choreographer for Balliamo! Folk Dance Troupe of Sacramento, CA. This dance is taken from the book Dances of Italy by Bianca M. Galanti, published in 1950 by Chanticleer Press Inc., New York, NY. La Furlana Ziguzaine was danced spontaneously in the courtyards of the castles in western Friuli during the grape harvest. This is a courting dance; lively flirtation is an essential part of the dance. Formation: For one or several couples. If danced by several couples, after the intro, couples form a circle facing CCW with women to their partner’s right.